The Grand Old Party has lost its political plumb in Tamil Nadu long back. The current poll has given the Congress a chance to revive its relevance. However, selection of candidates such as Karthi Chidambaram who is on bail and facing serious corruption charges, made a dent in the mood of the party cadres. 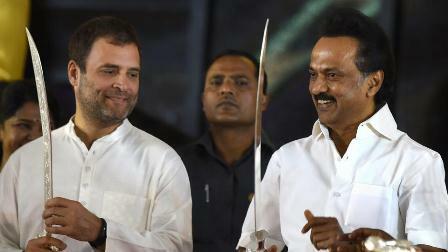 The Grand Old Party, Indian National Congress (INC) has lost its political shine long back; but sustains its presence with the support of the Dravidian party, the DMK, that had a role in demolishing the Congress party in the state. Current election which has put the party under serious revival bid across the nation, since it was able to get just 44 seats in the 16th Lok Sabha, is also reflecting in the state, ultimately. In this background the present alliance of UPA in which the INC is an integral part has to make itself an indispensable political force in the state. In this background current poll has given the party a chance to revive itself under the young leadership of Rahul Gandhi. Now it feels comfortable under a DMK led Mega Alliance and also got 9 seats in the state and was let to contest in Puducherry seat. It is said that earlier enthusiasm of the party cadres, though dwindled in numbers from the past, has declined since the party did not field vibrant candidates to capitalize the mood of the time which, according to few traditional party supporters, is anti-incumbency. A traditional Congress Party district level official said that the candidate selection in fact made a dent in the mood of the cadres. Since there are brighter candidates than the current ones especially in Trichy, Karur and Sivaganga, the candidate selection has not gone well with the cadres. The party has fielded many past members including EVKS Elangovan andManickam Tagore. The sitting legislative member and pioneer hire-purchase retail chain owner H Vasanthakumar (also uncle to TN BJP chief and neighbourhood constituency candidate of Thoothukudi, Dr Tamilisai Soundararajan) is taking on Minister Pon Radhakrishnan in Kanyakumari. The only woman candidate is Jothi Mani contesting in Karur. Ex state head Su.Thirunavukkarasar is contesting in Trichy. 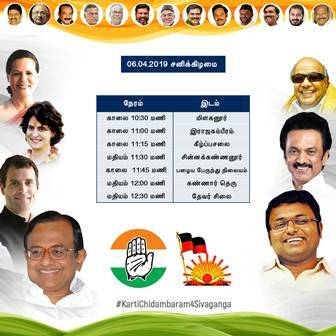 In Sivaganga, the contesting candidate Karthi Chidambaram is embroiled in legal battle and on bail. It is rumoured that he got the seat through strong protest of his father P Chidambaram. Speaking to Delhi Post, one of the state spokesperson Americai V Narayanan said that the anti-incumbency is widespread and the election manifesto has in fact become a hero. He dismissed that the open revolt of E M Sudarsana Natchiappan has been resolved and he now constructively contributes to make Rahul as the PM. Accepting demotivation of cadres at few constituencies he said it always happens across the parties during elections. The party in due course of time had considerable vote share but receded to just 6 percent in the recent past. Contesting at nine seats this time, it has increased the chance to boost it. But the senior official denies that no vote share is consistent and varies accordingly. He pointed out that in 2014 they contested independently and got considerable vote against the Modi wave. Hence their popularity still holds high. He also said public has realized that a decade long UPA government has in fact brought out several development programs, unlike the 37 AIADMK members who did not make any significant achievements. Despite such arguments the party has fielded only one woman candidate Jothi Mani who was denied to contest in Aravakurichi during assembly elections. It is noteworthy that the state has more women voters, surpassing male voters in many constituencies. The new voters enlisted are around 13.96 lakhs and their ballot would make a change. Recently Rahul had a meet in a private college in Chennai among young voters. He has highlighted the unemployment problem and in the manifesto has promised 68 lakh jobs across the country. This is the major hope for the party according to few other cadres. They also indicate that the direct benefit transfer (DBT) of Rs 72,000 per annum has reached deep into the public mind and would echo at the time of voting. Hence shortly to say that the party in the state has better bet this time to reap a good vote harvest and winning their candidates for 17thLok Sabha.